Why do you shoot tintypes? I’ve always enjoyed working with alternative photographic processes. When I was in college, I worked for a photographer who was making images on a modern version of the tintype that used a liquid emulsion. Because of this experience, I was already quite proficient at pouring various liquids onto metal plates. 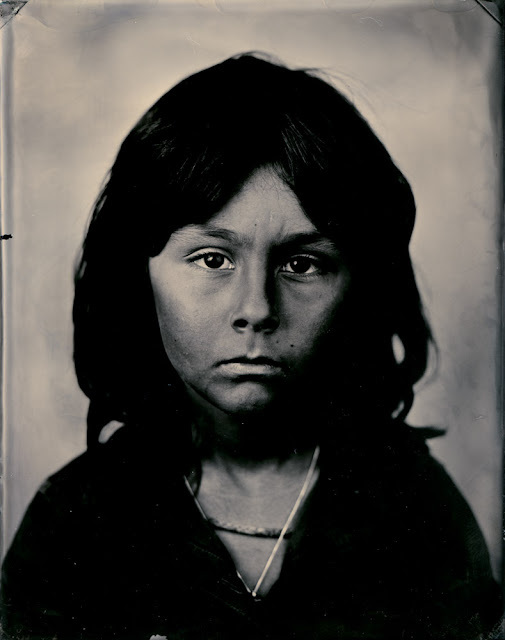 When I learned to create tintypes this summer, I picked up the process quite easily. But, to answer your question, I shoot tintypes because I love the immediacy and unpredictability of the process. I love that the tintypes are one-of-a-kind objects that cannot be infinitely reproduced. But throughout the project, my favorite part has become how amazing portraits of people, especially children, can look with this process. 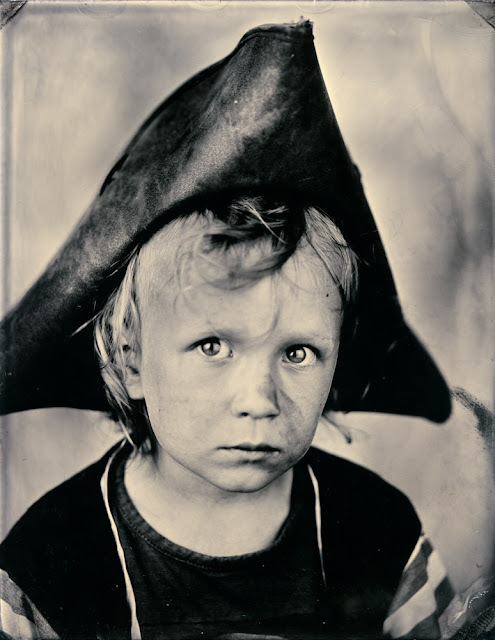 Aside from headshots I'm curious what other subjects you've photographed using tintype. 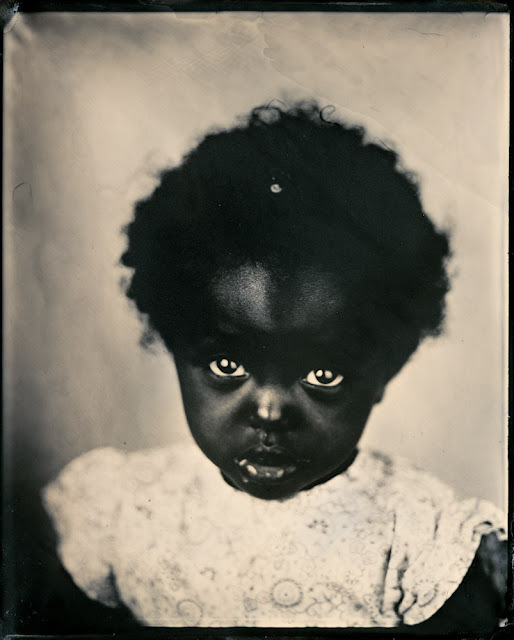 The wet-plate collodion process is relatively new to me. 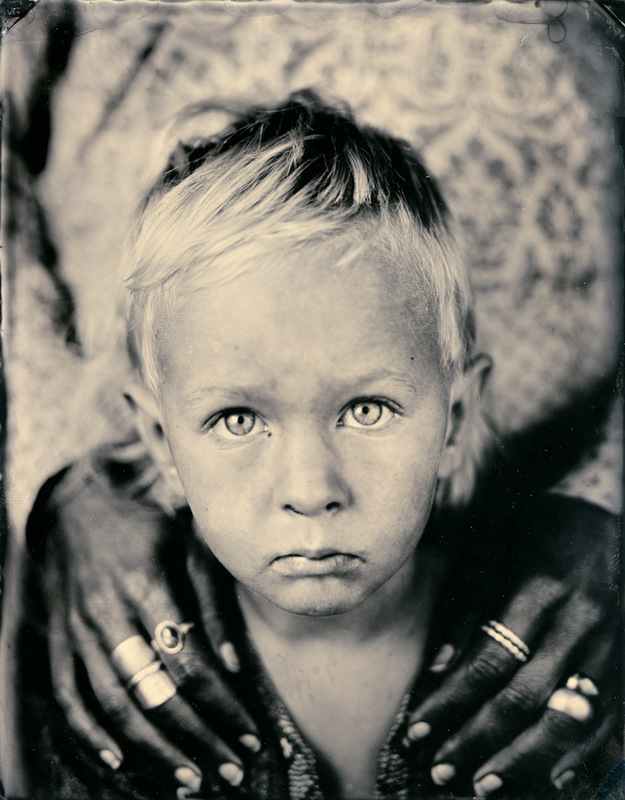 Although I’ve been a photographer for years, I just learned to make tintypes this past summer. Other than the numerous tintypes I’ve made of my wife and my son and the huge amount I made of the 49 kiddos I shot for the show, I’ve also made a few plates of my garden and my boston terriers. Most photographs in the show are not for sale. Is that a conscious decision to avoid the art market? Or is it just because these photos are one of a kind and belong to various parents? Tell me about the process of photographing small children. I know they have a mind of their own, and don't always cooperate with the photographer. Does it take a lot of energy and/or shots to get the right one? Do you try to translate some of a shoot's uncertainty into your photos? I did my best to not direct or suggest any poses to the kids, other than asking them to look at the lens. Also, I absolutely did not ask them to smile. Because of the amount of time it takes to prepare and develop the tintypes, the majority of the time the kids were at my house for the session, they were running around and playing. In a hour long session, I’d only be able to make 3 or 4 tintypes, meaning that they’d only have to sit in front of the camera 3 or 4 times. I really wanted to try and capture the kids being themselves. However, sitting a kid on a stool in front of a huge 8x10 view camera, a massive softbox and a gigantic umbrella in the garage of a stranger’s house, hardly leads to a natural expression. Despite all of that, I think that the quick exposure times, the limited amount of shots over the session and the excitement and participation of the parent(s) helped in making some great images. Being a younger sibling, the youngest of 17 cousins, and one of the youngest on the block, I didn’t have much exposure to little kids until my son was born 2.5 years ago. I have been totally amazed and overwhelmed by the depth, knowledge and complexity of young children. My son and his little friends amaze me every day. What's the most profound thing a kid has said to you during a portrait session? Do you think a portrait can describe what's in a person? Or does it just show someone's surface at a given time? I think that most formal portraits of people are incredibly telling. For many of the subjects in this project, this might have been the first picture-taking experience where they were not asked to smile. Usually, it worked out that the first exposure was the one that I chose to use in the show. After getting the kid(s) to stand still or sit on the stool, it would take me a few minutes to get the image mostly composed and focused. The kids seemed to get over their initial jitters and didn’t know what to expect. I think the first shot best captured the kid’s natural expression and depth at that moment in time. Name one favorite portrait photographer. I’m going to continue to explore the wet-plate collodion process. For this show, I shot 49 kids in 36 days. I just haven’t had the time to play around with the process, push the limits and make big mistakes. I’m really looking forward it. I hope to have the opportunity to show at more galleries. How do you characterize the Portland photo scene? The “scene” seems to be alive and thriving. The city is full of amazing photographers, and there is constantly new work being shown in the local galleries. In my experience, I’ve mostly just met other photographers and artists through The Newspace Center for Photography. One artist I met there, whom I’d like to mention is photographer Ray Bidegain. He taught me how to make tintypes last summer and has been a great friend and mentor ever since.